Addressing alcohol in sexual violence prevention programming is no easy feat, especially when our policy language and our prevention frameworks don’t neatly intersect. We understand that a majority of campus sexual assaults occur while at least one party is under the influence of alcohol, we understand the alcohol is used as a weapon of violence and as a mask to hide harmful behavior behind, and we understand that drinking alcohol does not put a victim or survivor at fault. But when it comes to getting this message across while tackling questions from eager and frightened students like “What if both/all people involved are intoxicated?” as well as plugging campus policy around drinking and sexual assault, we can see how our well-meaning messages can get lost. 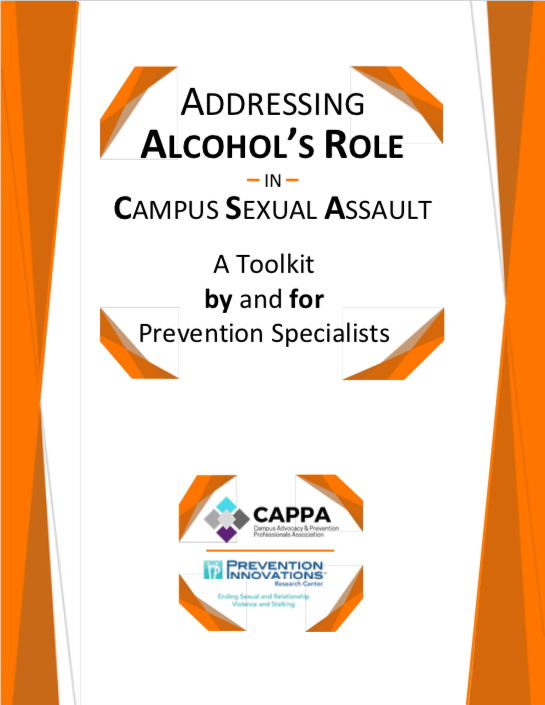 Thankfully, Campus Advocacy and Prevention Professionals Association (CAPPA) just released a new toolkit to help us clear muddy waters and take a social justice approach to addressing alcohol’s role in campus sexual assault. What’s unique about CAPPA’s Addressing Alcohol’s Role in Campus Sexual Assault: A Toolkit by and for Prevention Specialists is not just the conversational, advice-guide approach, but also it’s attention to navigating privilege and oppression within the campus system at large and how it relates to alcohol and sexual violence. Examples from the toolkit include relationship-building, establishing trust, and motivating leadership within marginalized campus communities and insuring peer educators, staff, and faculty with privileged identities are not telling students with marginalized identities the changes they should wish to see, but instead allowing campus change to be driven by those most impacted. This also includes not making assumptions based on dominant culture about the behaviors, attitudes, or expectations of students with marginalized identities. The toolkit also examines how to address alcohol and sexual violence across the social ecology, ideas for partnerships on campus and within communities, and challenges as well as advice from the field. One thing you won’t find in this toolkit is any information, advice, or messaging that puts the onus of alcohol-facilitated sexual assault prevention on the potential victim or survivor. Instead, this toolkit urges preventionists to go beyond the what NOT to do and into examining what it would look like to be truly trauma-informed by promoting the needs, experiences, and resiliency of survivors. This toolkit is a great first step towards gaining confidence in having authentic, impactful conversations and messaging around alcohol and sexual violence. We need more conversations, not less, and this toolkit can help reduce fear around getting the alcohol conversation wrong.